Setting up stall in the post New Year slump three years ago as part of Butlin’s on-going campaign to fill the void left by ATP on their sites with music festivals, Rockaway Beach is fast becoming the best way for alternative music fans to start the year. The surreal nature of an out of season Bognor Regis, on a half shut holiday camp feels like the perfect setting for a fine array of established and up-and-coming acts to soundtrack a very different kind of classic British holiday – one where Red Coats are replaced by goths in full regalia and the ghosts of indie past haunt the establishment as a nostalgic reminder of days gone by. Chalet living, classic arcades and water park included, Rockaway Beach has much to offer for a fraction of the cost of other events over its three days. After a long trek to the south coast, the entrance to the festival is greeted by Madonnatron’s tribal cacophony of sound. We arrive for the final song, during which their dark post-punk shimmers has descended into a compulsive blast of frantic guitar noise, violent shrieks and hollas. It’s a mouth-dropping start, the kind of rock that challenges perceptions will keeping a distinct groove. The darkness parts for the light of Benin City, a multi-dimensional London three-piece who wrap real-world and political hot takes in a genre-defying concoction of danceable tunes. Led by front-duo Joshua Idehen (providing dulcet rhymes) and Shanaz Dorsett (with soul-filled vocals) the party gets going with house synth stabs, trip hop ambience and the odd freeing blast of jazz sax from music maestro Tom Leaper. It often sounds like Faithless at their most anthemic with the downbeat edge of Ghostpoet. Idehen is a charismatic performer dropping inspiring thoughts in between songs (“Everyone here is made of magic. We are all made of magic. Except May, she is not!”) – the whole thing is endearing and witty. The pace is dropped to a crawl as the night moves into the cavernous Centre Stage venue, with Laetitia Sadier Source Ensemble’s jazzy, retro-futurist pop not hitting the right notes on a Friday night. It’s faultlessly performed but feels like all the downbeat moments of Sadier’s classic group Stereolab pinned together. Goat Girl, with the addition of a fifth member and with three new brilliant tunes in tow, prove exactly why they are one of the most vital new guitar acts of the past few years. Despite the band’s conditioned, on-stage nonchalance they create a swirling mass of sound that blasts with more urgency than on their hypnotic album. Sure, the beguiling harmonies and haunting guitar are still present, but live tonight they take on a punk power that elevates the stalking danger of their tunes to new heights. Maximo Park is a strange band. I was fairly sure they had disappeared, following that short blast of popularity in the mid-90s landfill indie peak. Apparently not. Needless to say, tunes like ‘Apply Some Pressure’ and ‘Girls With Guitars’ stir up some nostalgia but have not aged well, at all. For all of Paul Smith’s energetic stage presence and crowd-baiting, it’s simply not enough to ensure they are worthy of a headline slot, bringing a mixed bag of a day to a whimpering conclusion before the Special’s Terry Hall spins predictable tunes whilst looking bored into the early hours. It’s only 11am and Butlin’s is already much busier, with a quota of Numanoid’s and other assorted goths starting to fill up the place in preparation for electronic music legend Gary Numan’s headline set. But before that, an eclectic line has much to offer. I’ve looked them up and can find nothing about them, but Winter Garden’s are a young band starting to make a competent composite of dream-pop/shoegaze. Their set is marred by bad sound (you can barely hear the singer’s lovely voice at times) and for their ambitions of noise, everything is subdued. A brave cover of Cocteau Twin’s ‘Pearly Dew Drop Drops’ is a good enough take on an untouchable classic, and their guitarist’s rock posturing doesn’t match the music he is playing. There’s something there and I hope we can find out more. John J Presley brings some guitar virtuosity to Reds with his Americana-tinged rock drawing on blues-riffs and introspective tales narrated by his smokey vocals, before Desert Mountain Tribe’s put on a powerful performance. The London-based trio delivers engulfing psych-rock with the full-on blast of rock. Pounding drums and a bass sound to crack mountains drive the music along with a frantic compulsion. Their set is delivered with vigour and a sound that recalls everyone on from Bauhaus to Black Rebel Motorcycle Club. “We’re just a bunch of queer, silly sausages from Scotland,” states Spook School drummer Niall McCamley. This statement sums up the band’s politics, identity and sense of fun. Their lo-fi, C86, punk-pop ditties tackling gender, sexuality and queer issues are a breath of fresh air! Few bands deliver their music with such wild abandon and sense of purpose and while sloppy around the edges each song is packed with big pop hooks and endearing vocal harmonies. They win over a sizeable crowd and leave having conquered an audience sceptical at the outset. The 2019 live version of Menace Beach is an engaging composite of what the band is about, condensing the classic indie sounds of their early records with the synth-driven take of latest album ‘Black Rainbow Sound’. This newer material is beefed-up in the live arena and sits perfectly with the rockier tracks. These days front-duo Liza Violet and Ryan Needham face each other, centre stage, stationed with synths and electronics pushing out the swirling electronic underbelly to their punk meets krautrock tunes. One of the tightest bands on all weekend, Menace Beach have a clear understanding of how to deliver their myriad styles live. Genre-hopping is an on-going theme as Atlanta’s Algiers take to the stage. Opening with the industrial-soul banger ‘The Underside of Power’ they progress through tunes that collide gospel, industrial rock, trap, electronic and classic rock into powerful aural political statements. Ex Bloc Party drummer Matt Tong is still a powerhouse underpinning the groove and singer/guitarist Franklin James Fisher has a classic soul voice. Camp dancing from bassist/electronic maestro Ryan Mahan offers another juxtaposition to the music unfolding. Few can deny that Algiers is the perfect postmodern musical blend for our troubled times, the light cracking through the darkness. New DIY indie heroes The Orielles are being right royally sold short. The sound is so low they are becoming background music and to a room of hardened Numanoids they aren’t getting the best reception. Some miserable old bastards even took to Twitter to berate the band! But basically, forget those guys. Through it, all the band deliver a great set of energetic, jangly indie-pop with a subtle funk edge. The extended jam on ‘Sugar Tastes Like Salt’ is a wonder to behold, but this is the wrong time, to the wrong crowd for them to truly shine. Undoubtedly, today is all about electronic legend Gary Numan. After a comeback in recent years that has seen Numan step out of the wilderness, personally, musically and critically, now feels like the right time to again embrace a true pioneer. The final date on an epic year-long tour, the out of season Butlin’s has the level of surrealness and dystopian air perfect for an epic set. 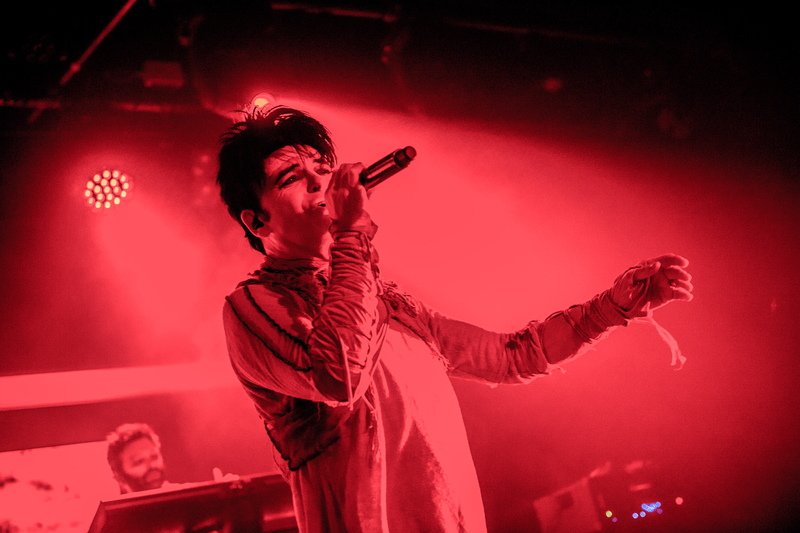 Revitalised by the sounds and imagery of industrial metal this new Numan plays homage to acts like Ministry and Nine Inch Nails, who in turn he influenced – he has come full circle. Coming on stage, the band dressed like lost Mad Max characters and in front of a giant video wall beaming strange visuals this is the complete Numan show, now with heavy riffs and engulfing darkness. The modern tunes do all have a similar air, the formula works but it does feel like he has found a new comfortable niche (something that can’t be criticised). However, when his classics ‘Cars’, ‘Me! I Disconnect From You’ and ‘Are ‘Friends’ Electric?’ are played the brilliance of this new direction becomes apparent. They are reworked with heavy guitar, crushing bass and additional beats bringing them into the industrial realm, and it works perfectly. Gary Numan is back at his best and it is a sight to behold. Compared to last night Butlin’s feel’s like a ghost town this morning, with the departing Numan crowd either still in bed or already departed a diminished number are people are still around to witness Brighton’s Squid, who is undoubtedly a top tip for 2019. Every now and then a band emerges that just connects with everything that is needed in rock music, Squid is one of those bands. Their ramshackle set brings in a dazzling array of styles from indie-pop and punk-funk to krautrock and psych, all underpinned by the kind of dance beat that drives LCD Soundsystem. Drummer/vocalist Ollie Judge bangs out precision beats, sings and yelps like a mad man possessed while each and every member dips in an out of styles with incredible musicianship which includes myriad percussion, synths and trumpet in the mix. With the same sort of expansive post-punk ethics as Canada’s Crack Cloud, albeit a funkier version, Squid is a band that everyone needs to see – they are all that is good about new rock music. On the other hand, when people make the assertion that ‘rock n roll is dead’ there’s a high chance they have just seen The Luka State perform live. Seemingly created by a marketing panel to service the kind of dad rock fans who listen to Radio X and bang on about ‘real music’ (meaning sloppy rock tunes from the 90s, or 60s or whenever) the four-piece preen and swagger around the stage, a solid embodiment of rock cliché with tunes trapped somewhere between Northern Uproar (they wish they could be Oasis) and the Stereophonics worst b-side. On stage banter about shagging “birds” and “’aving it” completes the cringe-worthy package. If this band in any way denotes the state of modern rock n roll, the genre needs taking out back and putting out its misery, or at very least my misery! With the festival fatigue kicking in and everything still in the shadow of Squid, the afternoon in Reds struggles to reach the heights of the first set. Sure the classic rock/power-pop of Jemma Freeman and The Cosmic Something has some bite, especially with Freeman’s onstage get-up – military style dress and haphazard white make-up – challenging the idea of ‘image’ for female rock stars, a middle-finger to the male gaze. For all their hype, Yassasin delivers a set that feels forced and unnatural, especially a laughably contrived end to the set with awkward shouting and forced ‘fun’. The musicianship is good, but all in all, they simply don’t have the memorable songs or stage-presence to make them stand out. The Filthy Tongues try the dark rock of Nick Cave and the Bad Seeds but don’t quite work, no matter how solid they are as musicians. It falls to Mexico’s Lorelle Meets The Obsolete to turn up the heat again. Bringing their intense new album ‘De Facto’ to the stage they now push electronics to the fore of their psych-rock wall of sound. Tonight their performance is a masterclass in restrained noise, all elements (the surging guitars, clattering electronic beats and heavy live rhythms) coalesce into a wave of sound, like an acid rock Factory Floor. They end in a crushing collapsing of sound as a guitar is handed to the crowd as pedals are violently abused. They never made it on to Top of The Pops but the fact indie-heroes Art Brut still exist and their self-lamenting, indie pastiche still, not only works but packs a punch is something to rejoice. Still very much a vehicle for the acerbic wit of front-man Eddie Argos, we arrive as he kicks into a half-hour, hilarious, ad-lib as the intro to classic ‘My Little Brother’ and throughout out it is Argo’s louche delivery that drives the performance. Tonight Wedding Present drummer Charles Layton joins behind the kit and looks like he has never had so much fun. Art Brut’s riffs are big, their lyrics are clever and they are the most fun band on the live circuit, somehow a decade on the joke still hasn’t worn thin! While Argos is laughing with the crowd, you get the sense that Echo & The Bunnymen frontman Ian McCulloch is sniggering at the crowd. In between songs his Liverpool drawl omits talk that could be a joke or could be a scolding – but what more do we expect? Often overlooked in the canon of exceptional 80s bands the Bunnymen, in this live arena, provide a masterclass in intellectual pop, each part fitting perfectly into the overall machine. The sound is inch perfect as guitarist Will Sargent unravels his classic, signature sound propping up McCulloch’s soaring vocals, which after years of doing everything that should kill a voice, he still provides on top form. The career-spanning set, whilst a little subdued for a Sunday night festival closer, is an engulfing spectacle which peaks with the double whammy of ‘The Killing Moon’ and ‘The Cutter’ – two contenders for the best tune of the 80s. They should have left on this high but return with ‘Lips Like Sugar’ and ‘Ocean Rain’, which while epic in their own right, leave the set floating on a limp note. Banishing the January blues, Rockaway Beach again proved itself to be an essential and under-rated part of the alternative music festival calendar, making an out-of-season Butlin’s on the south coast a must-visit. Excellent review (I was there by the way) – how refreshing to read some degree of criticism in a report so often they are factual and evasive when bands should be getting a deserved roasting (Luka State I am looking at you). Ironically I wasn’t quite as keen on Gary Numan’s set which was not (in sound anyway) all that different to when I last saw him in 2001. Although his actual sound is good – it wears a bit thin when you have the eight consecutive mumbled bit followed by false ending followed by guitars making a crashing return. Algiers were the “winners” of the weekend for me – decent sets from so many as well, notably Lorelle, Squid , Winter Gardens, Squid and Friday openers Rapid Tan. You must one of the best sets – Chupa Cabra!